We landed in Portland today. We promptly picked up our pimp sled (a Hyundai Elantra) and headed directly to Rogue headquarters for an interview with president Brett Joyce at the nearby Green Dragon (but that is another story my friends). 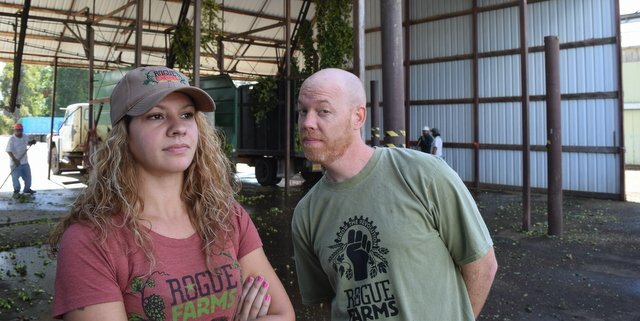 Right now, we’re navigating the Oregon countryside, finding our way to Rogue Farms in haunted Independence, Ore. We’re partnering with Rogue Ales and Spirits this week to celebrate the final days of the 2016 hop harvest, and we’ll be sharing this boots-on-the-ground experience with CBB readers all week long. We’ll be stationed in Rogue’s Hop N Bed farmhouse for the next few days, which is nestled in the lupulin Valhalla that is the Willamette Valley. The hop yards surround the farmhouse, and a quick walk onto the property produces potbellied pigs, osprey nests, turkeys, a pond full of large-mouth bass and homegrown gardens of pumpkins, corn, jalapeno, hazelnuts and beyond. Everything is fed by a blistered Oregon sun out here and then quenched with the rain shadow of Mt. Hood. Winter floods overflow the Willamette River, which regenerates the fertile soil and only sits a few minutes’ jog from the 100-plus-year-old farmhouse we’re staying in (the nearby hop processing plant and Chatoe Rogue Tasting Room are even closer). Kevin Singh liked this on Facebook.